Not sure what happened to my previous topic so sorry if this is a double post. Forgotten Sanctum installed and Pallegina suddenly leaves my party (we have a pretty good rapport, I think, and I have a good rep with Vailian Trading). Maia leaves suddenly as well. Pallegina leaves and stands in the middle of the ocean. The cursor changes to speech, but you can't interact. I can confirm this occurs whether I complete the Crucible fight or not. Hey, Stoicromance. I've put in a bug for this issue. Thank you very much for attaching the files and screens. I've sent this to the programmers to have a look. She is so stubborn that she refuses to sink. She's the new Eothas! Look at her size compared to the ship! I've had the same problem. I have her at max positive and the VTC is just as high. However, suddenly, after siding with the Principi (Furrante) I get this letter from her saying I've repeatedly done damage to the VTC. It's right before Ukaizo to so I'm waiting for a fix otherwise I won't finish the game for a while. Yeah this is in my pre-endgame save as well. Seems like something they did to Pallagina messed her up in general. She's my main healer and off-tank as a herald and now her chants are completely messed up. I usually play an RPG to distract myself from holiday stress, and this was my planned RPG DLC...I want to be able to finish my playthrough, this is ridiculous. Edited by Carnifexus, 20 December 2018 - 04:44 PM. I have also had Pallegina leave my party after completing "A Dance with Death". 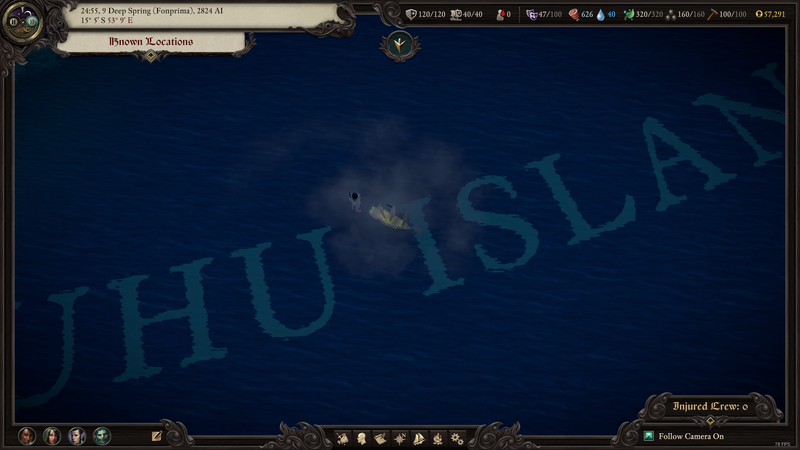 After completing the quest she leaves as soon as you sail away from Dunage. I have not had her marker glitch and stand in the ocean or Maia leave as the OP had. Did this ever get looked at? The Area Design team took a look at the saves and noticed that they all had reasons that would trigger Pallegina to leave the party. Most of the companions have triggers that can cause them to leave the party if they are unhappy with decisions being made by the watcher. I'll list Pallegina's triggers below. If the Watcher does harm to the VTC. This includes blaming them for the Powderhouse incident. If the rival faction in Hasongo has been determined to be the VTC. If enough negative reputation is gained. 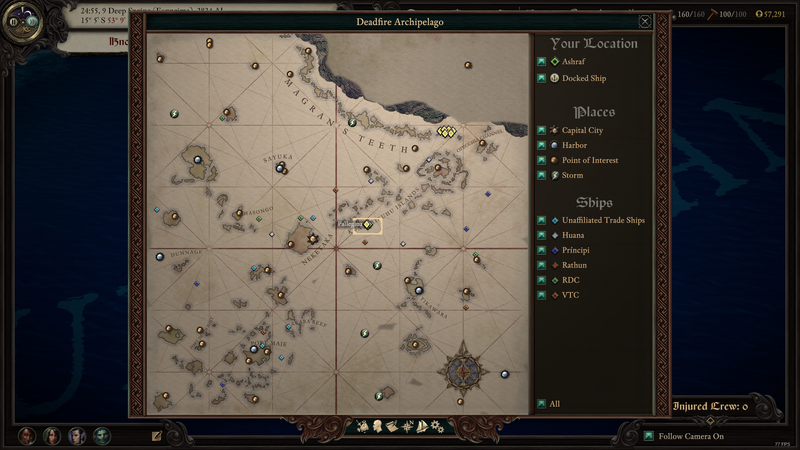 I do believe there was a bug where Pallegina was not leaving the party properly earlier in Deadfire's release, but the bug was fixed and allows her to leave the party as intended. If you think you are not triggering any of these situations, we are more than happy to take a look at the conditionals set in your saves(send it to me at support@obsidian.net), but so far the devs have seen that the conditionals of the saves have been triggered negatively by one of the above reasons. Thanks everyone, and sorry for any confusion with Pallegina. And what exactly determines that? Can you tell us? Thanks SChin. Just figured it was a bug because it was comorbid with her standing in the ocean. Was wondering if it was a bug keeping her IN my party in the first place. I've been holding off sailing to the final island until now because I wanted to do everything (including the 3 dlcs) first before getting an ending. I always try to do a completionist run for my first playthrough. I was happy with my playthrough since I had max relations with everyone (except for Aloth) and did not openly antagonize any major faction in the process. I did not side with any faction, just planned to go at it solo. 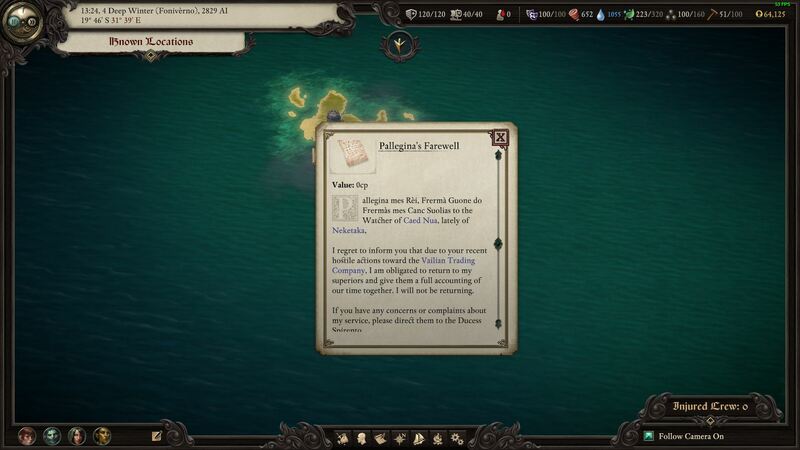 Then, all of a sudden, Pallegina leaves the party without any prompting whatsoever and goes to stand in the ocean. I thought this was surely a bug since I had max relations with her and good relations with VTC as well. Also, she was standing in the ocean. Obviously, I couldn't continue playing until this got sorted out - otherwise, I'd have to just abandon one of my companions that I'd adventured with the entire game. It just breaks immersion in a big way since I'm emotionally invested in seeing *my* version of the story to the conclusion. If Pallegina left right after one of the triggers mentioned here it might have been easier to accept. Pallegina leaving not in reaction to something I've done in-game but just because I've updated the game... this really ruins my enjoyment I don't want to come off as being too whiny, but I just wanted to describe how I feel about this issue because I love the Pillars series - to the point that I can readily forgive minor bugs and be content to wait for a patch to fix them until I start playing again. Thank you for reading, and sorry for rambling. I am also very upset with that descision. Pallegina is my favourite companion since PoE1 and i would definetly not do anything to make her leave. According to what you say, she should have left the party long ago because one of my previous action. But she did not, and there was no hint that she should have (like reputation change or dialogue). Now i feel like i was punished retrospectively for some previous action without getting any hint it would happen and any chance to avoid it. Actually if she left my crew at any point of the game, i would reload a savegame and change my descision to keep her in party. Now I am far ahead from that point and completed first and second DLC. I do not want to play further and complete the game without Pallegina, but neither I want to replay (not sure i even have a savegame from that time). So I will probably just drop the game now. Which is sad, because I really waited for all 3 DLC to come out before i go to settle the score with Eothas. So i would say that fixing such a bug at that point is a wrong. Instead of improving gaming experience, it actually made it worse for a lot players. Anyway, thank you for the great game, really loved it from the start. This is quite disappointing and bewildering, to make such a change, because on my seventh play through the game, I already expect characters to behave in certain way, so based on that previous experience, I could not have reasonably expected Pallegina to suddenly leave when on previous play throughs, she hadn't done so under the same circumstances. And it's not like I have done something terribly offensive to VTC in the game where this occurred. I hadn't even done the powderhouse quest. I allied with the Principi, but my standing with VTC was still positive, and for example, I resolved the Poko Kohara confict in their favor. So this does not make much sense. Please reconsider reverting this 'fix'. I suppose I can replay the previous 8 hours, but really, it's still very frustrating. I've put Pallegina back into the party of some folks via console command. She also seemed to keep the same reputation values that she had prior to leaving the party. if this is something you would like me to do for you, then send me your save file to support@obsidian.net along with a link to this thread as a reference. I'm more than happy to get that set up for you Please let me know what class Pallegina was as well as what equipment she had so I can reequip her as well.